Imagine you are a young doctor in Gaza during the current war: there is terrible destruction, frequent and fearsome airstrikes, some 200 of your fellow Gazans have been killed and more than 1000 have been wounded. Local hospitals are facing a shortage of medicine and equipment, particularly for trauma injuries. Surely you would want nothing more than a cease-fire to end this misery? Apparently, the logic is that when a conflict provoked by Hamas has already cost some 200 lives, yet more lives have to be sacrificed in order to enable Hamas to reach its goals. “In 2005, the Palestinians of Gaza, free from their Israeli occupiers, could have taken a lesson from the Kurds — and from David Ben-Gurion, the principal Israeli state-builder — and created the necessary infrastructure for eventual freedom. Gaza is centrally located between two large economies, those of Israel and Egypt. Europe is just across the Mediterranean. Gaza could have easily attracted untold billions in economic aid. 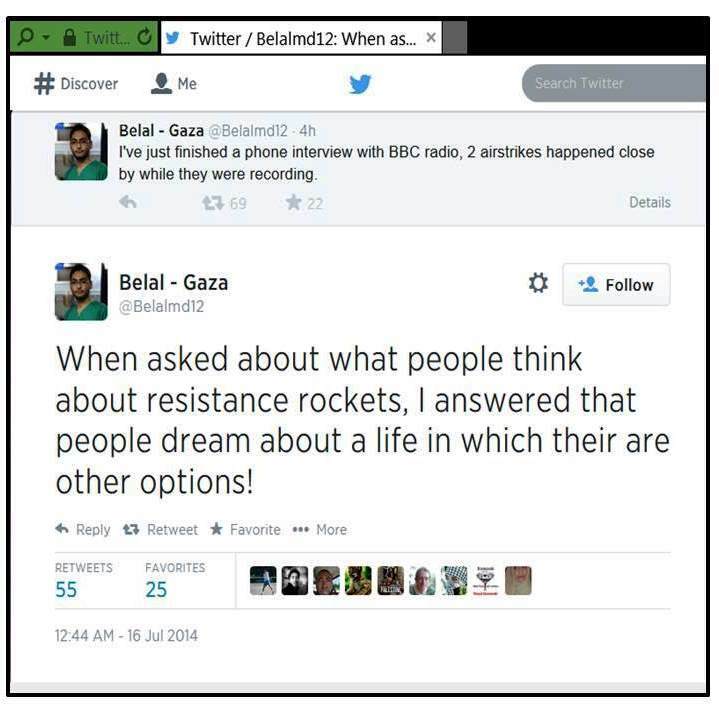 Sadly, while Gazans like Dr. Al-Dabour who now oppose a cease-fire in order to give Hamas more time to achieve some sort of “victory” may claim that the people of Gaza ‘dream about a life in which there are other options,’ they will only ensure that there will be more wasted opportunities as long as they see nothing wrong with the “resistance rockets” of Gaza’s terror groups. Couldn’t a medical doctor be expected to be smart enough to realize that these “resistance rockets” inflict much greater damage on Gaza than on Israel? 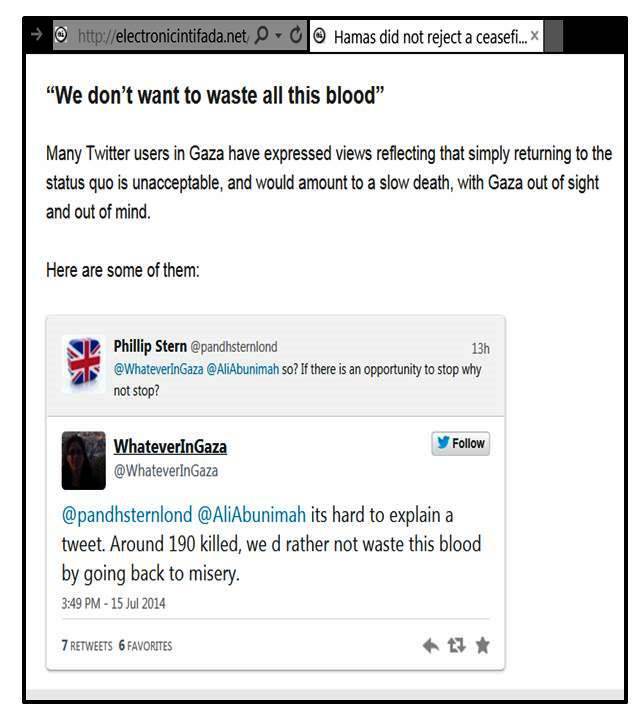 First published on my JPost blog. The same official also said that despite the authorization, the ground operation was delayed in order to give the Egyptians another opportunity to forge a cease-fire. On Wednesday, Shin Bet security service chief Yoram Cohen, Netanyahu’s envoy for the peace process Isaac Molho and the head of the Defense Ministry’s political-military affairs department, Amos Gilad, traveled to Cairo. The Israeli delegation shared the iftar, the meal breaking the daily Ramadan fast, with Egyptian intelligence chief Gen. Mohammed Ahmed Fareed al-Tohami and his senior advisors. After meeting for a few hours, the delegation returned to Israel. The message Cohen, Molho and Gilad brought back was that Hamas is only increasing its demands, hardening its position toward a possible cease-fire. The BBC’s recent effort to do away with “Arab Spring myths” is rather remarkable: it’s a very short piece that doesn’t really bust any myths but instead perpetuates some of the all-time favorites that inform much of the BBC’s Middle East coverage. Among the supposed myths tackled by the BBC is the notion that the so-called “Arab Spring” has somehow weakened Arab passion for the Palestinian cause. Not so, argues Roger Hardy on the BBC’s website. 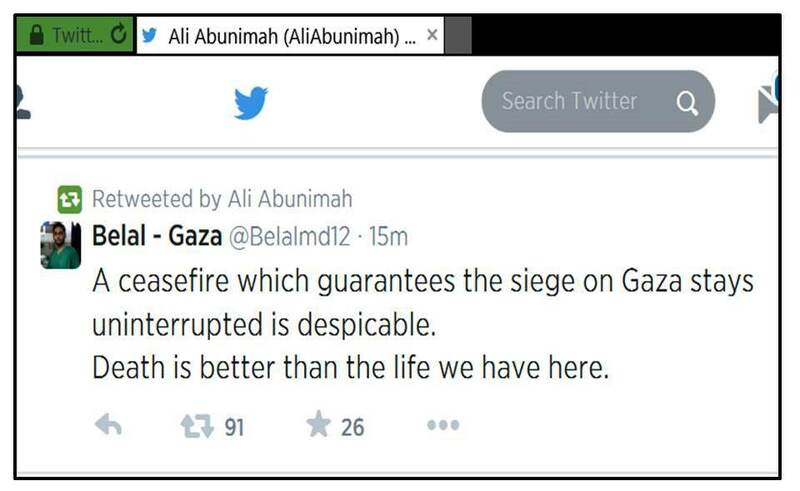 Exhibit A for the validity of his view is the attack on Israel’s embassy in Cairo in September. This is an interesting rhetorical question that can be read in two ways. Since this is the BBC, bigotry can surely be ruled out, and we can therefore safely assume that it is not meant to imply: You simply can’t expect those Arabs to come to their senses and realize that neither Israel nor America are causing any of the problems that have condemned the Arab world to decades of backwardness. So we are left with the second option: the anti-Israeli and anti-American sentiment that is so prevalent in the Arab world is a rational expression of legitimate criticism directed against specific Israeli and American policies that should and could be corrected, and doing so would drastically diminish hostility towards Israel and the US in the Arab world. I’m tempted to describe this as the mother of all Mideast myths. According to the Congressional Research Service, Egypt has accrued $69 billion from the United States since 1979, while Israel has gained $98 billion. In fact, the two countries have been the largest recipients of U.S. foreign aid since 1979. […] Cairo has been able to sharply reduce its military budget since the 1973 war. According to the World Bank, Egypt’s military expenditures consumed approximately 2 percent of its gross national product in 2009 (about $3.8 billion), compared to more than 20 percent in 1976. This drastic reduction has allowed Cairo to reallocate military funds to economic development projects. Furthermore, a third of all Egyptian exports to the US come from Qualifying Industrial Zones that provide free-trade access to U.S. markets and encourage economic cooperation between Israel and Jordan and Egypt. The often-heard argument that most of the US aid for Egypt has benefited the military and that therefore ordinary Egyptians would naturally see little reason to temper their anti-American sentiments doesn’t quite square with the slogan “the army and the people are one” that was so popular among Egyptian demonstrators earlier this year. Until very recently, the vast majority of Egyptians clearly regarded their army with pride and admiration – never mind the fact that for decades, it has been financed, trained and equipped by the despised US. But let’s not beat around the bush: anti-American sentiments in Egypt and elsewhere in the Arab world are largely due to the notion that Arabs should be able to demand that the US cease supporting Israel so that Arab hatred of the Jewish state would have a better chance to prevail. And it is just another mega-myth that an Israeli-Palestinian land-for-peace agreement would result in a dramatic decrease of anti-Israel and anti-American sentiment among Arabs. We already know for sure that the peace agreements with Egypt and Jordan have not reduced Arab hostility to Israel or the US; likewise, Israel’s withdrawal from Lebanon and Gaza and a large part of the West Bank have also not improved matters in this respect. So why pretend that it is reasonable to expect that the establishment of a Palestinian state in the West Bank and Gaza would suddenly change all that? Unsurprisingly, there is a politically correct purpose that is served by this myth: once you acknowledge that there is precious little evidence for the belief that Arab anti-Israel sentiments are rooted in specific and legitimate political grievances that can be addressed, it will be much harder to avoid looking at the plentiful evidence that points to deep-seated hatreds and the unwillingness to accept Israel’s right to exist as a Jewish state. I can’t find any mention of this by the BBC – though it is quite inconceivable that the BBC would ignore an endorsement of a Muslim genocide by a non-Muslim religious leader of comparable stature. But it seems that it’s actually “progressive” to overlook Qaradawi’s vicious expressions of antisemitism and claim instead that he is a staunch supporter of democracy. Right: One standard for Muslims and Arabs, another one for those Westerners – particularly Israelis and Americans – who only have themselves to blame for being hated in the Arab and Muslim world. A lot of myths have to be created to cover up this bigotry. And it’s a myth – and a pernicious one at that – to believe that the kind of “anti-Israel” sentiments expressed by Qaradawi can be addressed by any policies short of Nazi policies. A slightly different version was posted on my JPost blog.